The massive growth of the global population has been an issue in the recent years because it also brings an increased number of challenges and pressure to the humankind. Different organizations around the world have been working hard to maintain a healthy environment and one of which is DuPont. 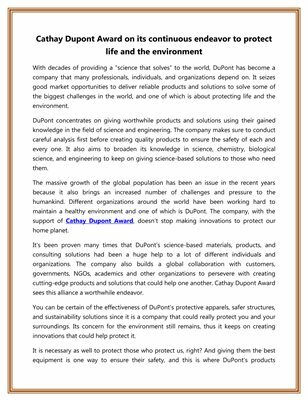 The company, with the support of Cathay Dupont Award, doesn’t stop making innovations to protect our home planet.